Our Diabetic Life: Fun Fundraising, it's worth a try! Fun Fundraising, it's worth a try! I love our dog. He is amazing. ‘Nuff said. So why wouldn’t I try to raise money so that Dogs4Diabetics could help more people? I didn’t have to pay for Lawton. He was given to us free of charge. I feel some responsibility to share the love. Last week we had our annual school fundraiser for Dogs4Diabetics at the boys’ elementary school. All the kids were asked to bring in one dollar sometime during the week, and if they did, they could wear their favorite hat to school all day on Friday. As I alluded to in my last post, I spent most of last week in classrooms giving presentations and answering questions about our dog, and about diabetes. You wouldn’t believe some of the great, thoughtful questions that came from these children’s mouths. You also wouldn’t believe some of the crazy, not so well thought out questions that came from these children’s mouths. Over the past few years, I’ve learned that if I visit a class, and talk with them about what we are raising money for, the class will participate on a MUCH greater scale then those I do not speak to. So this year I spoke to almost every class. This is a great fundraiser for your walk team too! 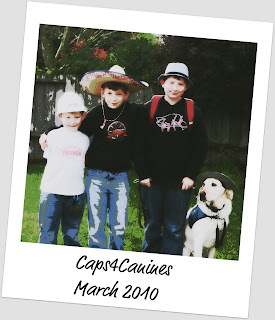 Before we got Lawton we had the caps day, but instead it was, “Caps4aCure.” It is really easy to put together. A flyer in the school newsletter. A little spiel at the kid’s assembly. Envelopes with class lists attached, so the teachers can check off who brings in their dollar. Maybe a few classroom presentations. Kids wear their hats….BAM! Done. Kids CAN make a difference. It is empowering. I hear stories every year of kids wanting to use their own dollar, or kids who ask their parents how they can earn more money to donate. The whole experience is so positive for everyone! Awesome! Amazing job Meri... and that pic is so, so cute! I love Lawton's hat! I really want to get a D dog for Jack. I so wish D4D placed dogs in AZ. I would love to know more about Lawton. How wonderful Meri! What good you are doing! Congrats to you, the boys and to Lawton too! Has anyone told you today that you are simply AMAZING? Thanks, as always for inspiring us all. GREAT picture and WOW thats some good funds raised!!! You are awesome as always! Excellent, I love the photo of the boys and Lawton in their hats! I love the D4D program - I first heard about it when the AZ Republic did an article on a little boy here who has a dog trained to sense his highs & lows. It was a great story. I would love to learn more over time. I know the kids have to be older before they qualify, so we have a ways to go, though.